The members of the Atascadero City Council all served on the city's Planning Commission before getting elected to their seats. In other words, they've been engaged in city politics for a long time. With three candidates vying for two vacant seats—left by Brian Sturtevant, who isn't seeking re-election, and Heather Moreno, who is running for mayor—in the upcoming November election, community members such as Rick Mathews are calling for a fresh face. 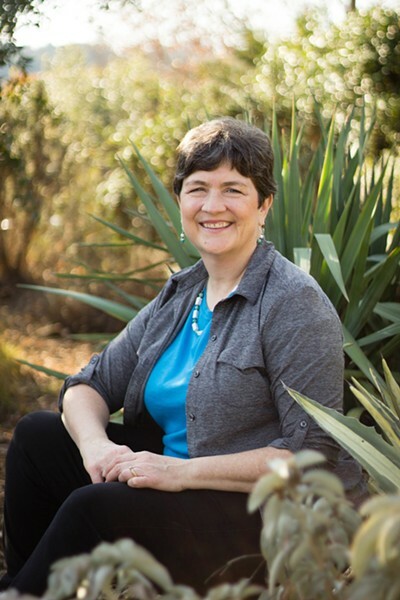 ROUNDING UP LOCAL SUPPORT Susan Funk's campaign for a seat on the Atascadero City Council is focused on bringing in local revenue. Mathews, the founder of Madrone Landscapes who's served on several city commissions, said he's on board with City Council candidate Susan Funk, a 10-year resident and businesswoman. "I think it's a unique dynamic here in the city of Atascadero, some of it has to do with the longevity of residents and some of the issues are around nepotism," he said. "I find Susan to be a refreshing change from that, I don't feel like she comes with an agenda other than the genuine interest in seeing progress in quality development for our city." According to a campaign finance statement, Funk has already raised more than $12,000 from local donors. And $500 of that came from the Atascadero Democratic Club, which supports Funk's campaign. Funk owns Kailos Group Inc., a consulting company in the health care field. She said she works with companies to find opportunities to improve the quality of a product while reducing its cost. Funk's campaign focuses on calling for the efficient use of resources—water, energy, and taxpayer dollars—creating a more engaged community, and active city support to create a thriving downtown. Her main goal, she said, is to work with the city and bring in local businesses to Atascadero in the hopes of boosting its revenue. "I think the critical thing for us is to be able to build an economy that's strong enough to be able to sustain that [small town] feel while serving the needs of the whole community," she said. While Funk's been on the campaign trail since March, Mark Dariz is just beginning his campaign for a spot on the council. He has been an Atascadero planning commissioner since 2011, becoming its chair in 2015. He's also served on the city's Design Review Committee and San Luis Obispo County's Regional Transportation Advisory Committee. "As an architect and wheelchair user for more than 30 years, I brought valuable perspective to the Planning Commission," Dariz told New Times in an email. "I've worked to improve the quality of life for all Atascadero residents." His campaign focuses on modeling open and transparent public communication, working with community leaders to bring jobs and businesses to the city, and using his experience as an architect to help guide development in the direction to strengthen the economy of the city.